How one manager transformed an organization historically known for late delivery, poor quality, and low morale into an energized team that produces high-quality software on schedule. It's a small world after all, and no where is that more evident than in the world of software, where differences in language and desktop settings can cause applications to crash with no warning. Turn to The Last Word, where software professionals who care about quality give you their opinions on hot topics. This month, Karl Wiegers shares some common misperceptions about requirements. We're pleased to bring you technical editors who are well respected in their fields. Get their take on everything that relates to the industry, technically speaking. 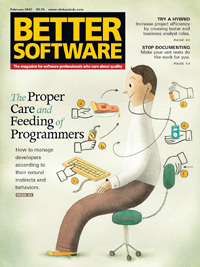 In this issue, discover why reflex might be the key to better software development. One school of thought says each should do what he's best at and no more. But one company has graduated to a new way of life. Instead of isolating testers and business analysts, the two teams are melded into one—resulting in a more robust product created in less time at a reduced cost. Could this hybrid approach work for you? System documentation is a pain to do and it's even harder to keep up to date. What if, by refining the unit tests you already are doing, you could create documentation automatically, and have it be automatically updated? Find out how one team is making it work for them. Developers are a unique bunch. They tend to have innate characteristics that cause them to approach problems in ways that leave their managers scratching their heads. Discover what natural behaviors are likely to cause conflicts and what you can do to work with those instinctual traits, instead of against them.